Mold testing may help determine the association of mold exposure to symptoms experienced in your home. According to the EPA molds produce allergens, irritants, and potentially toxic substances. The EPA also recognizes that mold exposure can trigger asthma attacks and according to the Asthma and Allergy Foundation of America (AAFA) over 20 million Americans are affected by asthma, 30,000 people each day have an asthma attack and 11 people die daily due to asthma. Since carpet dust acts as a reservoir for collecting materials that were previously airborne, a procedure for easily collecting a basic dust sample was developed. The process involves collecting a single dust sample from the residence that is then analyzed using advanced mold-specific quantitative polymerase chain reaction (MSQPCR). The dust collection device is supplied as part of the kit along with complete sampling instructions and a prepaid return shipping container to the laboratory. Fortunately now there is a quick and affordable method to test your home for mold using cutting edge science developed and backed by the United States Environmental Protection Agency. Help determine how mold levels in a home compare to a national "moldiness" index. For individuals selling their home, a test before a buyer's home inspector examines the property will allow the seller to rectify any mold problems that are found, increasing the property's value and desirability. For individuals buying a property, a test for mold in the home before the property transaction takes place, can have an enormous impact on the decision to purchase and the value of the property. 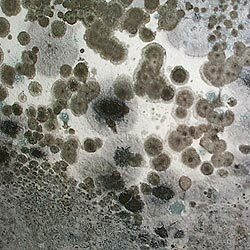 Mold found after the sale can lead to potentially unhealthy conditions and expensive repairs.